experience is usually pleasant and comforting to them. Our sister clinic has, Firetower Animal Clinic, had had a therapeutic laser for a few years with grand success. Although improvement is often seen after the first visit, most patients require several treatments for greatest benefit. Treatments vary in length, but most sites require 2 to 8 minutes. A majority of patients exhibit greater comfort and mobility within 12 to 48 hours after a laser treatment. 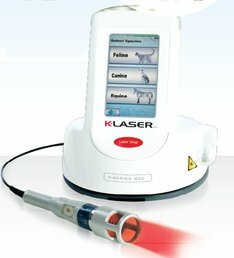 Laser therapy can relieve pain, reduce swelling and increase range of motion. During each treatment, laser energy increases circulation, drawing water, oxygen, and nutrients to the damaged area. The infrared laser light interacts within the cell, improving the trasport of nutrients across the cell membrane. This creates an optimal healing environment that reduces inflammation, swelling, muscle spasms, stiffness, and pain.